In this third part of a series on building a DJ template, Dubspot’s Rory PQ takes us through the steps of creating a DJ Assist Mix Fader Rack used to mix two tracks effortlessly for seamless transitions. Included is a FREE Ableton Live Audio Effect Rack. Check out our DJ/Producer Master Program, classes start soon. Enroll Today! In the first two parts of our series on building a custom DJ template in Ableton Live, we looked at how to build a basic DJ template and created some DJ-style effects triggered by Dummy Clips. In this third part of the series, we will build up the DJ template even further by creating an Assist Fader Rack for seamless mix transitions. Before we get to mixing our club bangers, check out the previous tutorials in our series on building a custom DJ template below. In this tutorial, we will focus on creating custom mix faders that will allow us to execute seamless transitions from one track to another quick and easy. 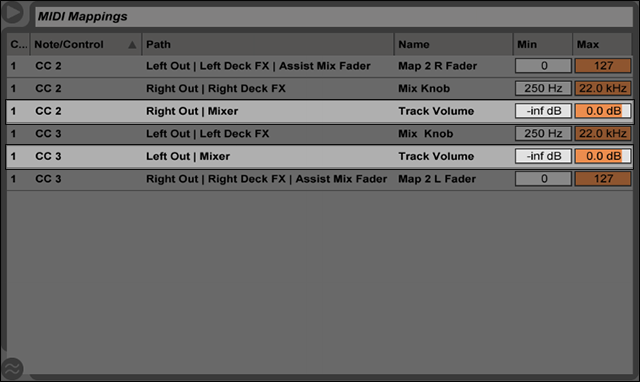 The Assist Mix Fader Rack we will develop in this tutorial can be downloaded for FREE by filling out the form below. What Does the Assist Mix Fader Rack Do? This intuitive approach to mixing makes it extremely easy to mix two tracks together without the need to fuss with any EQing on your preferred controller or mixer. Essentially, you can achieve silky smooth transitions with one hand leaving your other hand free to make hand hearts and wave to your mom at the club during your performance. Sounds intriguing, how does it work you may ask? Typically when transitioning two tracks during a basic mix, a DJ will first introduce the mid frequencies of the next track being brought into the mix. Once the next track is introduced, the DJ will perform creative mix techniques using the high and low EQ’s, as well as have some fun with various effects. With a simple move of a fader, the Assist Mix Fader Rack will introduce the mid frequencies first and then begin to accentuate the high and low frequencies next. The frequencies will balance at unity once the fader reaches its maximum range, typically 0 dB. In addition, sidechain compression is used to duck the volume on the current track playing when mixing in the next track. Adjusting the fader automates the threshold on a sidechain compressor and slowly introduces sidechain compression that is triggered by low frequency range set on the compressor. This approach will retain a tracks punch and help remedy clashing low frequencies that can cause phasing, muddiness, and volume spikes. The result when using the Assist Mix Fader Rack is transparent transitions with controlled lower frequencies and clarity. Bonus Tip: You could use this rack in Arrangement View and automate the Mix Knob controls to create transitions for mixes laid out in a linear fashion. Check out the Assist Mix Fader Rack in action below where I mixed two techno tracks together by simply adjusting the left and right Mix Knobs. Tracks: Justin James | Not The Curator and Nicola Assi | Tree. Both tracks released on refused. Let’s move forward and create this very versatile and handy mixing tool, shall we? For this mixing approach to work, we will need to create identical Assist Mix Fader Racks for both the Left Deck and Right Deck tracks. The only difference will be the sidechain routings. Jumping right in, let’s first create the rack and then move on to MIDI mapping the controls and finishing the setup. For this demonstration, we will work with the DJ template created in the first part of the series. Free download HERE. Drop in an Audio Effect Rack to the Left Out track. Load an EQ Eight device. 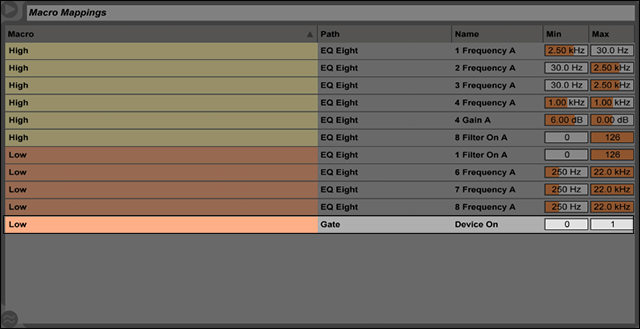 Group the EQ Eight into another Audio Effect Rack by clicking CMD [MAC] / CTRL [PC] + G on your keyboard. Select Filter 1 and the set the Filter Mode to Low Cut and Macro map the Frequency control and Activator switch to Macro 1. Select Filter 4 and the set the Filter Mode to Bell and Macro map the Frequency and Gain controls to Macro 2. Select Filter 8 and the set the Filter Mode to High Cut and Macro map the Frequency control and Activator switch to Macro 2. 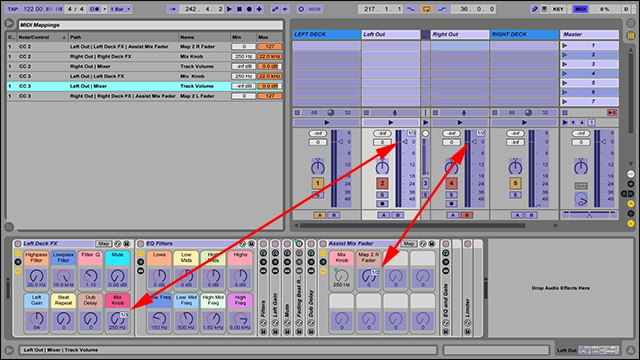 Click the Macro Mode Switch on the second Audio Effect Rack with the EQ Eight and adjust the following control settings in the Mapping Browser. This next step is optional but recommended to silence the output signal completely when the fader is down all the way. Load a Gate device just after the EQ Eight. Increase the Threshold to 6.00 dB. Decrease the Return to 0.00 dB. Macro map the Device Activator button to the Low Macro. Once again click the Macro Mode Switch on the second Audio Effect Rack and adjust the following Gate control settings in the Mapping Browser. For this step, we will create an additional rack for sidechain compression. This addition will help keep the low end in check during transitions while retaining the punch and clarity of the incoming track. It’s important to note that the Threshold is controlled by the opposite tracks mix fader. In other words, the incoming track will control the amount of sidechain compression being applied to the track currently playing. We will look at this further in the steps on MIDI Mapping the controls. Load a Compressor just after the Gate. Group the Compressor into another Audio Effect Rack by clicking CMD [MAC] / CTRL [PC] + G on your keyboard. Create a new chain by right-clicking the Chain List and selecting Create Chain. Expand the Sidechain Controls view and activate the Sidechain button. From the Audio To menu select the opposite track for playing back audio. For this demonstration, it will be the Right Deck track. Activate the EQ button and select High Cut for the Filter Type. Next, adjust the Frequency to taste. I found 120 Hz to work well. Adjust the Ratio, Attack, and Release controls to taste. Try starting with a Ratio between 2:1 – 4:1, medium-fast Attack at 50 ms, and a fast Release at 25 ms. Optionally you could bump the Knee up a bit and set up the Compressor to react to either Peak or RMS. Click the Chain button to show the Chain Select Editor, and Macro map the Chain Select Ruler to the SC Macro. Adjust the Zones for both chains to match the image below. Next, Macro map the SC Macro to Macro 3 on the second Audio Effect Rack, and then Macro Map Macro 3 to Macro 2 on the first Audio Effect Rack. Rename the Macro control accordingly. Finally, click the Macro Mode Switch on the Audio Effect Rack with the Compressor and adjust the following control settings in the Mapping Browser. This step is optional and only applies if you’re working with the DJ Template we created in the first tutorial of the series. Drag the entire Assist Mix Fader Rack over to the Left Deck FX Rack we created in the first tutorial and place it before the Limiter. Macro map the Mix Knob to Macro 8 on Left Out FX Rack and rename it accordingly. Before we move on to MIDI map the controls for a controller or mixer, we will need to create and set up an Assist Mix Fader Rack for the second channel. Luckily, much of the work in nearly completed. All we need to do is the following. Copy the Assist Mix Rack we just created and paste it into the Right Deck FX Rack just before the Limiter. 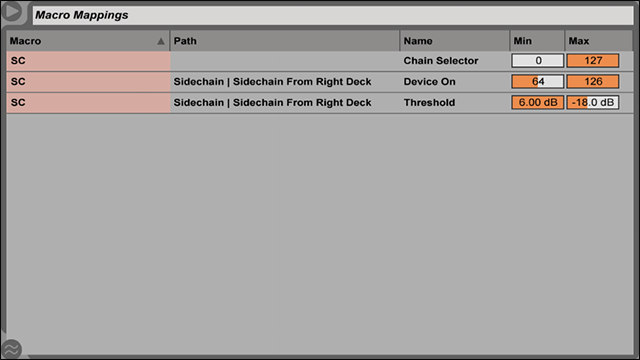 Expand the Sidechain Controls view on the Compressor and select Left Deck from the Audio To menu. Double check that the MIDI Mappings are correct in the Mapping Browser for each section of the rack. 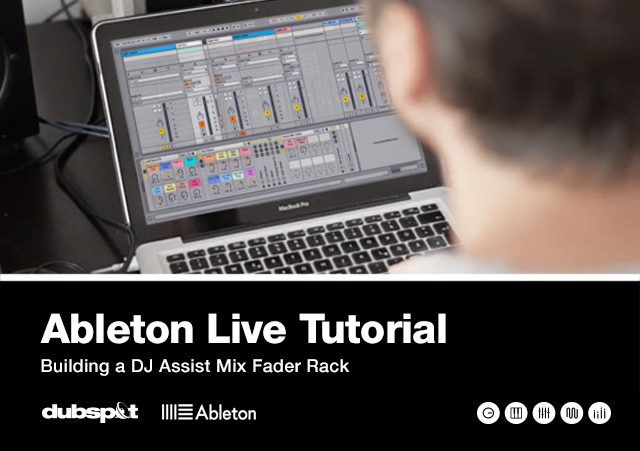 This final step covers how to correctly MIDI map the Assist Mix Fader Rack to your favorite controller or mixer. It’s important to note that the DJ template has aux tracks set up for our DJ effects. We have the option to MIDI map the Assist Mix Faders to the aux track leaving the main Left Deck and Right Deck faders to work as normal faders. To take advantage of having both options, you would need a second set of faders available on your controller. Let’s check out how to get this rack up and running. Click CMD [MAC] \ CTRL [PC] + M to turn on MIDI Map Mode. MIDI map the Left Out fader and the left Mix Knob Macro to the same fader on your controller for the left channel. MIDI map the SC Macro to your controllers right channel, which will be the opposite channel fader than the Mix Knob. Repeat the steps above for the second channel. Finally, while still in MIDI Map Mode, adjust the Track Volume Max amount for both tracks to 0.0 dB, so the faders max range is unity and not 6 dB. Great work, time to spin up the Disco lights and have some fun with your new DJ template. This tutorial may be the last in our series on building a custom DJ template, but it’s not the last time we will explore DJ and live performance techniques in Ableton Live. In the meantime, I encourage you all to experiment with the template, have fun, and shake some club speakers!